When I first started this blog, I always said to myself that I would be nothing but honest, Even if it doesn't sound all that glamorous. These past few days have probably been the most worrying days I have ever had to deal with. Before you start reading, I just want to say please listen to your body, if you don't feel right it is always better to be safe then sorry. On Thursday, we went shopping, It was a absolutely perfect day, Sam was off work, and we had some last minute things to buy, for the hospital bag, also bits and bobs that she still needed. Who knew you needed so much stuff. At about lunch time, I had said to Sam I wasn't feeling to great, and we decided to head home early. I had serious pains in my stomach, The only way I can think of describing it to you is like a stitch, but worse. If I turned, moved, walked, or even sat up after I had been laying down the pain would get worse. I was also feeling really tired and sick. I decided that I would wait it out and see if the pain went away, I was adamant that it was just a stitch, and it would be fine in the morning. Sam on the other hand wasn't so convinced. Being the worrier that he is, he took to google to investigate, he knows that I have a high pain thresh hold, and I wouldn't complain unless it was really bothering me. After typing in all the symptoms it came up with preterm labour. Sometimes it's known as Premature labour. I shrugged it off, said google always likes to exaggerate everything and ill see how i felt in the morning. With the promise that i would ring the midwife if it wasn't gone by morning - off to sleep I went. After the worst night's sleep i could imagine, and a persistent pain which spread from the left side to both side, I decided it was best to ring the midwife after all. After phoning her she advised me to ring the 'Day assessment unit'. After explaining all of my symptoms, she asked me to come down to the hospital at 4pm. Before hanging up, she asked me how Baby E's movements were, I could tell by the tone of her voice that she was worried, which obviously unsettled me a little. I told her that Baby E wasn't as active as she usually is, she said ok, at this point I could hear her scribbling away, and I was told to go down to the hospital as soon as possible, and to bring my hospital notes. When I arrived they took a urine sample, put me straight into a bed and attached me to a fetal assessment machine (I think this is what it is called, I could be wrong). 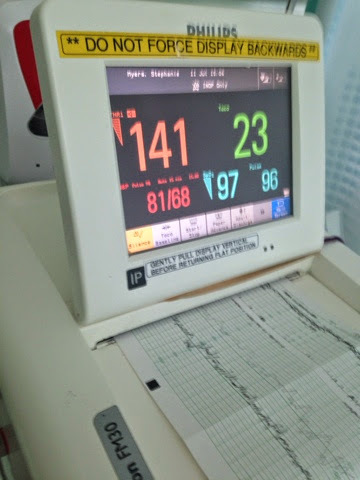 It monitors the babys heart beat, Toco - which is basically how much your uterus contracts during the time your being monitored, my pulse and blood pressure. Usually you're on this machine for 30 minutes to get a good reading, they then sent for a doctor and we had to wait. I have to admit the waiting part was horrible, The pain had got worse, and we obviously didn't know what was going on. When the doctor arrived he decided that the best thing to do would to preform a speculum exam. I have to be honest it is one of the most uncomfortable things I have ever experienced. A speculum is a device, which they insert inside you, to take a look at your cervix, It lasts about 30 seconds, but it feels like forever! The doctor also did a swab of my cervix while he was there to send to the lab. The results would take about 20 minutes to come back, but they would tell us if my body was releasing a hormone which it releases during labour. If it was this would mean I was in fact in preterm labour, which is what the Doctor though because my cervix had softened. 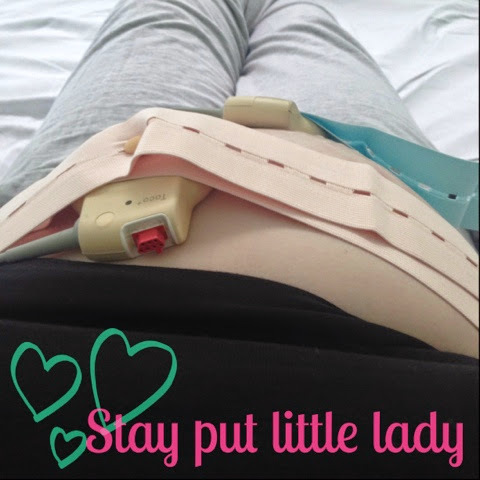 The result came back neutral (a fault with the machine) so I was reassessed and a further 20 minutes later the consultant came to inform us I was in preterm labour and this meant I needed to stay in hospital and both me and Baby E needed to be monitored. The midwife returned, took a blood sample and gave me a steroid injection to mature Baby E's lungs in case she comes early. Steroids will reduce the risk of the baby suffereing from the complications of being born very early. They class very early as anything before 34 weeks. Even though I'm in preterm labour there is only a 50% chance that she will be born. Everything could slow itself down, and it could stop naturally which is what both us and the doctors were hoping for. After being monitored all night, and the pain not easing off the doctor came around for his rounds. They re-examined my cervic, which had now closed - a positive sign that things were slowing down. My blood results had also come back, which showed that there were no problems with my organs. They had to rule out any problems with my organs in case that is what the pain was being caused by. Turns out the pain was actually contrations, which luckily were slowing down. The doctor said he wanted me to stay in another night as the pain still hadnt gone, it had eased off a little, but he wanted to monitor the baby for a bit longer before sending me home. They also wanted to make sure that I didn't go into labour aggressively because they felt it was to soon for the baby to be born. The doctor also said when i did go home, then I would be on bed rest to make sure that I wasn't doing anything to bring on the labour. The last thing the doctor said to me, was if the baby doesn't come today, and i go home the next day, there is still a high chance that she can come within the next two weeks. After a really sleepless night, the pain had settled because of all the medication they had given me, my contractions had completely stopped, and the doctor said i could go home, on the condition I was on bed rest, and I came back if I had any more pain, or lost fluid, or had any bleeding. So now I'm home. This whole thing has been really stressful, and a situation that I didn't think I would ever find myself in. I just wanted to write this, to let you all know (again), If you do ever feel like something isn't right, go get it checked out. I was silly enough to just shrug it off. I just want to say thank you, to everyone who has asked how both me and the baby were, it was lovely to know that i have some supportive and amazing people surrounding me. I have made some amazing friends and i just wanted you to know it doesn't go un-noticed. During pregnancy I hated always going in if I felt 'wrong' because I hated thinking I was wasting time for the nurses and doctors. But it's such a silly way to think because it could be a matter like yours where you went into labour early. Glad you got everything to slow down, stay on bed rest!! Oh you poor thing - those steroid injections hurt like a MUTHA! Stay put baba!!! !